Oink, oink, dear reader. Oink indeed. 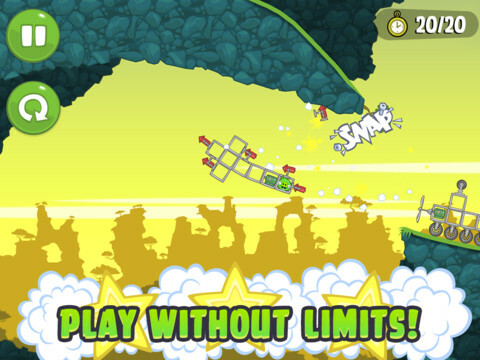 Rovio Entertainment's newest iOS and Android release, Bad Piggies, plays nothing like Angry Birds. Instead of launching characters at forts made of wood, stone and glass, you assemble vehicles using a variety of different objects and set them in motion to complete a series of goals. It's an ideal game for those who enjoy tinkering with contraptions and experimenting with physics. In fact, it may take several hours to complete the Sandbox levels alone. Suffice to say, there's a ton of value, but as you'll soon learn, patience is indeed a virtue. 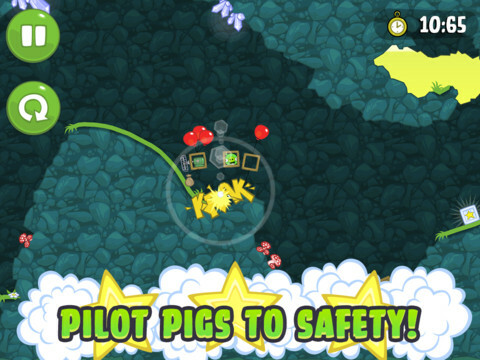 With this in mind, the pigs take center stage in this Angry Birds spin-off, where the object is to somehow ferry those diabolical swine from point A to point B (gold star number one) while picking up special boxes (gold star number two) and doing all this within a time limit (gold star number three). Achieving this, however, is quite tricky and borderline maddening. Success is heavily dependant upon your ability to not only build said vehicle, but also set it in motion while preventing this invention from tipping over and/or falling apart entirely. That said, the developers at Rovio supply all the necessary parts in each level, be it wooden crates, wheels, motors, fans, bottle rockets, bouncy springs, balloons, umbrellas and other useful items, and what's especially cool about this is the fact that you don't need to use all this stuff to solve a puzzle. It's OK to leave a wheel or crate behind so long as your creation behaves as it should. Assembly, meanwhile, couldn't be easier. You just drag the parts from the bottom of the screen to the middle, swapping them at will and/or changing their position via the arrows along the top; you can also scrap the whole thing by pressing the garbage can icon. 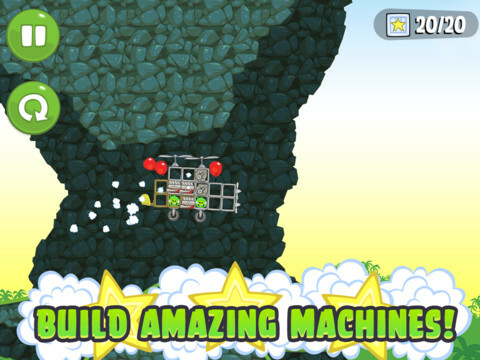 Of course, if you're willing to like Bad Piggies on Facebook (three for free) or spend some real world cash, Rovio provides a Mechanic Pig that instantly builds the most ideal vehicle, but here's the thing. You still have to make it run. That helps offset the option of cheating. A smart move, for sure. Now as much as we like Bad Piggies, it's obviously not for everyone, especially those who crave instant gratification. There's an unusual amount of trial and error that'll turn lots of folks off. What's more, Rovio didn't release a universal build. It's $0.99 on iPhone, $2.99 on the iPad with no Retina display or iCloud support. At this point, with several games and years of experience under its belt, the publisher continues to nickel and dime consumers. So there it is. Bad Piggies excels at offering wannabe inventors the opportunity to put their thinking caps on and show off their skills. It won't please everyone, and the game exists in the shadow of Angry Birds, but if you enjoy piecing things together to see how they work, you'll definitely fall in love with these oinkers. What's Hot: A wealth of tricky stages, more than one solution to most puzzles, head-scratching sandbox levels, surprisingly likeable pigs. What's Not: Huge learning curve, excessive trial and error gameplay, paying for Mechanic Pig, not a universal download, no iCloud support.